I have about six thousand different thoughts right now about Game Seven that I’ll get to tomorrow, but right now I just want to make a brief mention about Ryan Miller. 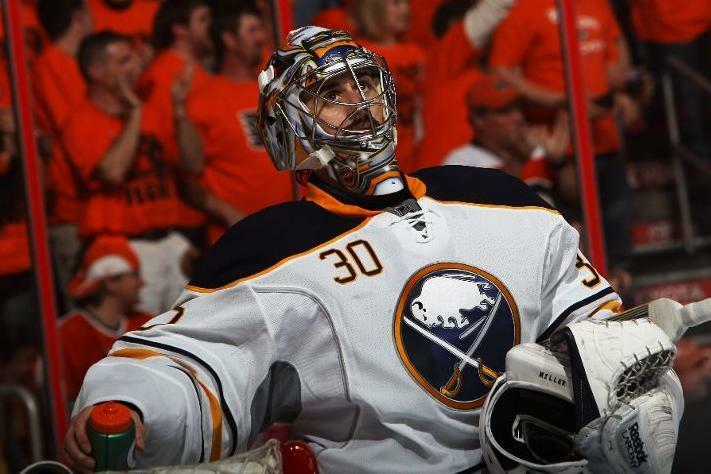 Ryan Miller single-handedly kept the Sabres afloat for a large portion of this series, and Game Seven especially. The first period was an absolute atrocity, but Miller was there every time for the first 19 and a half minutes. He let his team down once. They let him down half a dozen times. Miller rarely got to play with the lead in this series, a huge advantage for goalies, and as soon as the Sabres built one up for him, they let their guard down shortly after. Every Buffalo win in this series was by one goal — two 1-0 games and an overtime win. How often does a goalie steal a game for his team in the playoffs with a shutout, not once, but twice, and then still lose the series? That has to be maddening for a goalie. I’d imagine this scenario has happened a few times in NHL history, but it can’t be very often. To his credit, I can’t remember Miller being very vocal about it. If CC Sabathia threw two no-hitters in the same series for the Yankees and they still managed to lose, I’m sure he’d have a few choice words for the hitters after the fact. Looking at Miller’s play might show just how bad the rest of the team was. The two shutout wins were basically gifts to the offense. What did they do besides that? Not much. The pooped out after a hot start a few times and disappeared completely not long after. Ryan Miller was even credited with an assist in the series. He had the same amount of points as Brad Boyes, Mike Grier, Mike Weber, Chris Butler, Steve Montador and Jordan Leopold, all of whom played at least five games in the series. Try as he might, Ryan Miller can’t be counted on to provide the offense, too. Miller faced more shots than any goalie in the playoffs, and finished with a 2.93 goals against average and a .917 save percentage, respectable numbers that should have been more than enough to win given the poor goaltending Buffalo was going up against. Every Buffalo Sabre not named Tyler Ennis, Drew Stafford or Rob Neidermayer (the only players with positive plus-minuses) better chip in and take Miller out for a nice dinner after this is all said and done (Chris Butler can leave the tip, too). If anybody should be mad about the loss, it’s Miller, and I respect him for not saying anything about it.